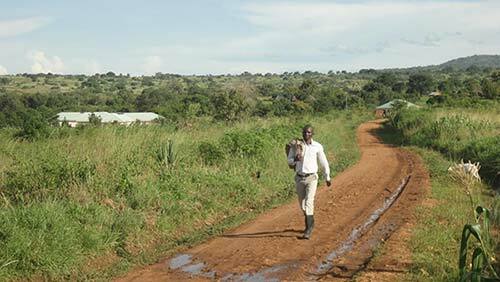 A man walks down a road in Nebbi, Uganda, where Father Freddy Ocun has begun a health clinic. A collection for World Mission Sunday will be taken up Oct. 17-18 in parishes in western Oregon. Organized by the Propagation of the Faith, the day is set aside for Catholics worldwide to recommit themselves to the Church's missionary activity through prayer and sacrifice. Mission dioceses — about 1,100 at this time — receive regular annual assistance from the funds collected. In addition, these mission dioceses submit requests to the Congregation for the Evangelization of Peoples for assistance, among other needs, for catechetical programs, seminaries, the work of religious communities, for communication and transportation needs, and for the building of chapels, churches, orphanages and schools. Young Freddy Ocun knew he wanted to be a missionary the day he saw an Italian priest zooming down a Ugandan dirt road on a motorcycle. Dreams of two-wheeling didn’t endure, but desire for priesthood did. 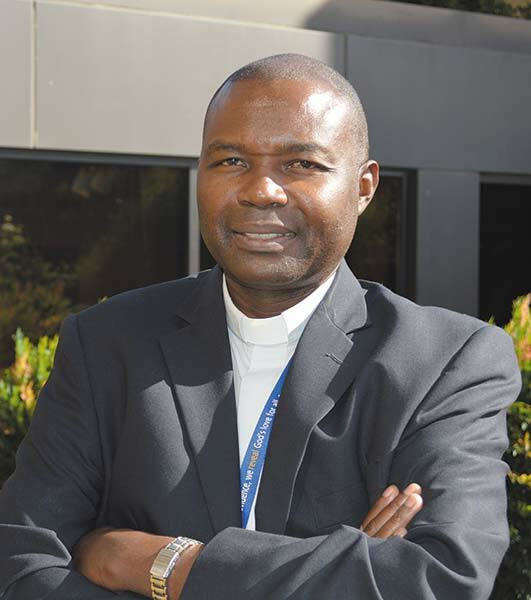 Father Ocun, director of pastoral services at Providence St. Vincent Medical Center, has come as a missionary to the United States. Father Ocun, 51, grew up in Nebbi, a village of about 5,000 in far Northwest Uganda and was ordained in 1996 in the Apostles of Jesus. The Catholic religious institute was founded in 1968 in East Africa to sustain the church there at a time when dictators were expelling European missionaries. The new institute also forms African priests to venture out to the peripheries — even Oregon. The institute has 400 priests and 1,200 seminarians. About 60 Apostles of Jesus serve in the U.S. There are five in Oregon. They live in Beaverton, close to the Sisters of St. Mary of Oregon, and serve at St. Vincent, Providence Portland Medical Center and St. Michael the Archangel Parish in Sandy. The missionaries in the U.S. send much of the money they earn back to Africa to pay for seminary education, building the future of Apostle of Jesus ministry. As a chaplain, Father Ocun has no easy answers. He helps sick patients learn to cope and adjust. One man came back to faith in his dying days, needing first to be convinced that God’s mercy extended to him. Father Ocun supports grieving families, some of whom are angry at God. “I love being here,” he says. To keep up strength in the demanding work, the tall slim priest is dedicated to prayer. “I cannot do this job without God’s intervention,” he says. He also survives by teamwork, with many Providence employees playing roles in caring for patients. He oversees 11 chaplains and a musician who plays for patients as a form of comfort. In addition to serving in Oregon, the priest is working from afar to help the people of his homeland. Father Ocun grew up having to watch his father, two sisters and a young nephew die of preventable diseases like malaria. His father, an outgoing and devout farmer, died a year before his son was ordained. The memory fueled Father Ocun’s desire to start a clinic in his home village. The major donor for starting clinic was Dave Showers, a man Father Ocun met while working as a chaplain in Canton, Ohio. Called the Showers Health Center, the facility opened in 2007 and is dedicated to Our Lady of Lourdes. The clinic serves about 20,000 people who live in an area of 1,200 square miles. Most are poor subsistence farmers. Patients come with malaria, cholera, HIV, tuberculosis, flu and various parasites from bad water. Father Ocun had a well drilled near the clinic to provide safe water. The clinic is staffed by eight nurses, a physician, two lab attendants and a manager. There is no government money or health system funding; it’s all private support, much of it from the U.S.
“We will always be grateful to this country,” Father Ocun says. The clinic never quite hits its budget, but neither has it shut down or turned away patients. People are asked to pay a small amount, both to sustain the work and to preserve dignity. But if they can’t pay, they get the same treatment as anyone else. Father Ocun wants to expand, adding a better lab. That will help with diagnoses for sicknesses like malaria. He also hopes to start outreach and education to improve sanitation and cleanliness. The clinic evangelizes by its very existence. Dedicated to Our Lady of Lourdes, it accepts anyone, but makes no secret that it’s a Catholic institution founded by a priest. On his annual visits to the clinic, Father Ocun is amazed by stories. People tell him their children were born there, or that their husbands or wives were saved from deadly disease. “It is a reflection really of what Jesus did,” as a healer,” Father Ocun says.